Woll's patent pending German engineered technology is more than just diamonds, it is the process. We combine real larger diamonds with advanced robotics in a multi-layer process. The difference is not just in the cooking surface, but also in the German manufacturing technology of an improved cast molding process, versus the more traditional method of pressure casting. 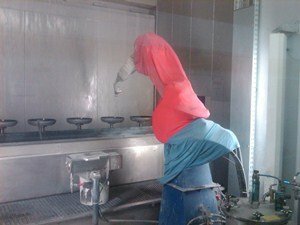 Woll's state of the art process eliminates the need for oily silicon materials used to release the pans from its mold. These materials are the fundamental reason for imperfections in the final product, such as bubbles and reducing a pans heat conducting ability. 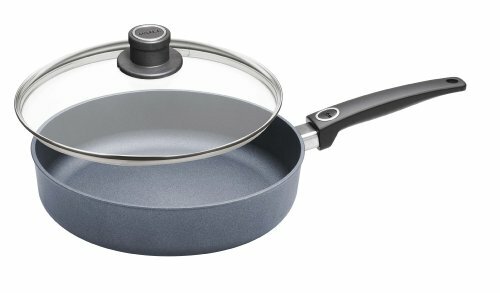 This brings Woll one step closer to creating the perfect pan. 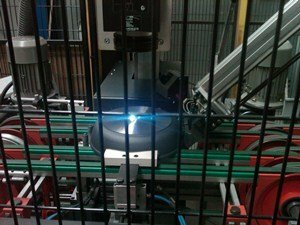 Woll's multi-function robotic engineering technology precisely controls the Nano-application process perfectly when applying the multilayer system of PFOA free nonstick material, to deliver a pan with superior durability and performance. This unique process includes meticulous cleaning and drying times in between each step of the coating application, strengthening the bond. It uses the equivalent of over 7 football fields in length of drying ovens to ensure a flawless application every time. The company's' German engineered manufacturing process is why Woll USA guarantees extended durability and lifelong cooking performance. The new, ultra-modern, green factory, designed by the original patent developer of diamond reinforced cooking surface, using a state of the art plasma gun at 36,032F/20,000C. New technology and patent pending surfaces of carbon nano tubes and larger diamonds allows for improved thermal and non-stick performance. This newest coating process is designed to do what wasn't even possible 2 years ago. Proven time tested hand casting craftsmanship and the latest casting machinery result in stress and void free pans. The coating facility has longer heating and curing ovens (over 7 football fields in length) which stabilize the curing process when applying the diamond or titanium coatings. This creates an extremely durable coating and prevents peeling or chipping. This process is computer controlled and allows for precise temperature control. The addition of an 'anti-corrosive' extra base sealant coating prevents corrosion of the underlying pan, and is unique to Woll. 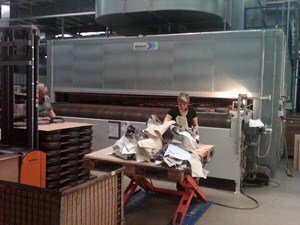 The entire facility exceeds all environmental standards and is approved by local and state governmental standards (extremely strict and difficult in Germany). The recent addition of new bottom milling equipment features water injection cooling to create a perfectly flat, mirror finish aluminum base. Select Woll products are gravity cast in steel dies with a refined high-purity aluminum alloy. It is not made under any pressure and flows naturally to fill the die, thus the pans can be 'shocked' (taken from hot to cold) without the pan warping. Whereas, pans made using the pressure/vacuum cast system need copper added to the aluminum to make it more liquid so that it can flow better into the die. Unfortunately the use of copper, combined with the casting process means there is a much higher risk of air bubbles forming in the pan which can create blistering, peeling and cracking of non-stick surface. It is not recommended to 'shock' competitor's stamped/drawn cookware as they have been made under stress and thus the chance of warping is much higher. A computer directed robotic arm articulates to spray non-stick on the inside and outside of each individual pan, instead of just arc spraying onto spinning pans. Computer control eliminates over or under spraying which can cause peeling and or cracking on deep or rounded surfaces. "Diamond Plus Induction" is the only diamond non-stick line that can be used on induction as well as gas, electric, ceramic, halogen, radiant and glass stove tops. 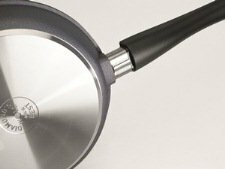 The thick 7.5 mm induction magnetic S/S steel base (using patent pending technology) is guaranteed not to warp or separate. In response to the trend towards a less heavy style of cookware that is easy to handle, Woll has developed a new range which combines the unsurpassed cooking attributes of the traditional gravity cast cookware, but now in a lighter and more functional format. 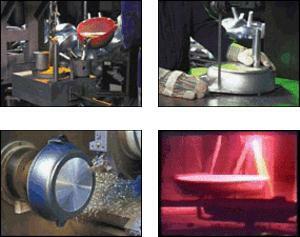 All existing "light weight" aluminum cookware is either pressure cast (die cast) or pressed from aluminum sheet. Both the above methods produce inferior cookware when compared with traditional gravity cast cookware, as they cannot guarantee even heat distribution. The method used by Woll to produce the lighter body is that once the pan has been gravity cast in the normal way, the molten aluminum in the mold is uniformly squeezed to thin out the profile. This process is called "squeeze cast" and affords Diamond Plus cookware the unsurpassed cooking attributes of gravity cast, but with the lesser weight attributes of die-cast cookware. Adding to this excellence is the incredible new nano-technology diamond coating "Diamond Plus". This new innovative coating is recognized worldwide as the best non-stick coating. 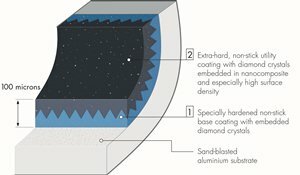 In Woll's new patent pending procedure, diamond crystals are heated to 36,032F/20,000C and blasted deep into the surface of the cookware using a plasma gun, forming an extremely hard base layer which is impervious to cuts and scratches. This diamond encrusted surface is harder and far more durable than the base layer used in most other premium cookware ranges. To this hard diamond base layer is added an anti-corrosive layer, then the primer and the final top coating that is infused with diamond crystals, and baked in at 450C. This ensures an extremely heat resistant and abrasion resistant non-stick coating, unmatched by any other coating on the market. The entire coating application takes 3 hours and the pans travel through over 7 football fields in length of ovens. Woll is so sure that its coating is the best in the world, that it has given it a limited lifetime guarantee. If you have any questions about this product by Woll, contact us by completing and submitting the form below. If you are looking for a specif part number, please include it with your message.